In 2014, residents of Flint, Michigan were impacted by a water crisis as a result of years of political neglect. The environmental trauma endured by residents, children and families has greatly impacted the level of stress and depression as the crisis lingers with little resolution. Flint is not alone - there are environmental crises that occur all throughout this country, including New York. 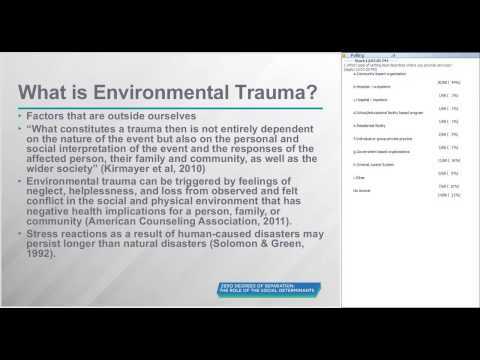 Environmental trauma can be triggered by feelings of neglect, helplessness, and loss from observed and felt conflict in the social and physical environment that has negative health implications for a person, family, or community. In this webinar, Robert Brown, associate director of the Center for Community and Economic Development at Michigan State University, and Kenyetta Dotson, a social worker, will explore the effects of environmental trauma while using the Flint, Michigan water crisis as an example. They will engage in a dialogue with participants to review what happened in their hometown and explore how participants may respond if it happens in their own communities.